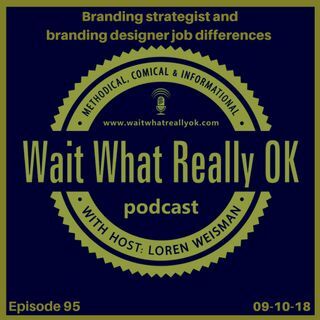 Wait What Really OK Podcast Episode 95 hosted by Branding Strategist talks about branding from the designer to the strategist to the ambassadors. There are many different ideas and opinions on what a branding person does. At the same time, there are many different views or perceptions. For example, I am a brand strategist and while I have a lot of ideas on logos and looks, I cant design to save my life. I also know graphic ... See More designers and web designers that are not branding designers. Then you have people that represent brands but can not create the brand. Then, go even deeper. How do you build a brand? What pieces have to come together? In this episode from planning the business to the business plan and deciding of the imagery to creating the content and the plan for the release, the funding and the distribution of the message, I try to make a bit of sense of it all in this episode. Episode 95 of the brand strategy podcast Wait What Really OK is called Branding strategist and branding designer job differences. The show is available on iHeartRadio.